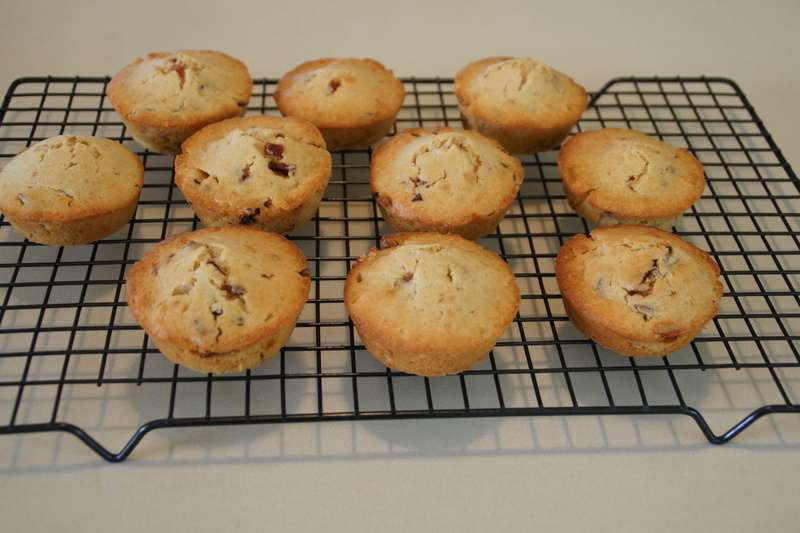 The April 2011 Daring Bakers’ challenge was hosted by Evelyne of the blog Cheap Ethnic Eatz. Evelyne chose to challenge everyone to make a maple mousse in an edible container. 1. Bring maple syrup to a boil then remove from heat. 2. In a large bowl, whisk egg yolks and pour a little bit of the maple syrup in while whisking (this is to temper your egg yolks so they don’t curdle). 3. Add warmed egg yolks to hot maple syrup until well mixed. 4. Measure 1/4 cup of whipping cream in a bowl and sprinkle it with the gelatine. Let it rest for 5 minutes. Place the bowl in a microwave for 45 seconds (microwave for 10 seconds at a time and check it in between) or place the bowl in a pan of barely simmering water, stir to ensure the gelatine has completely dissolved. 5. 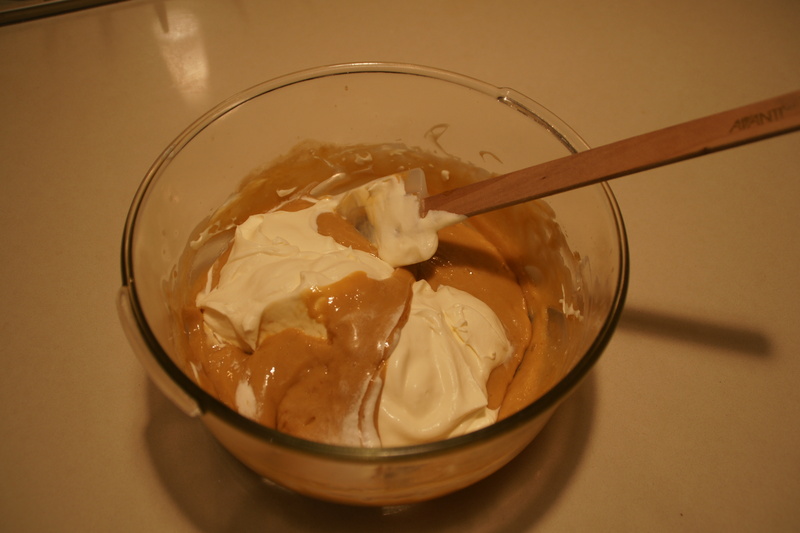 Whisk the gelatine/whipping cream mixture into the maple syrup mixture and set aside. 6. Whisk occasionally for approximately an hour or until the mixture has the consistency of an unbeaten raw egg white. 7. Whip the remaining cream. Stir 1/4 of the whipped cream into the maple syrup mixture. Fold in the remaining cream and refrigerate for at least an hour. 8. Remove from the fridge and divide equally among your edible containers. Here is a picture of the mousse as the whipped cream is being mixed in. Unfortunately I forgot to take a photo of the finished mousse but I can assure you that it was light and fluffy and convincingly mousse-like. Evelyne’s suggestions, or starting points for inspiration for the edible containers, included bacon cups and nut bowls. I have to be honest and say that I was a bit apprehensive about this challenge. I don’t actually like really sweet things and I’m not a fan of bacon. I always think it smells quite nice, but it’s never going to change me from a bowl of oats for breakfast kind of girl. 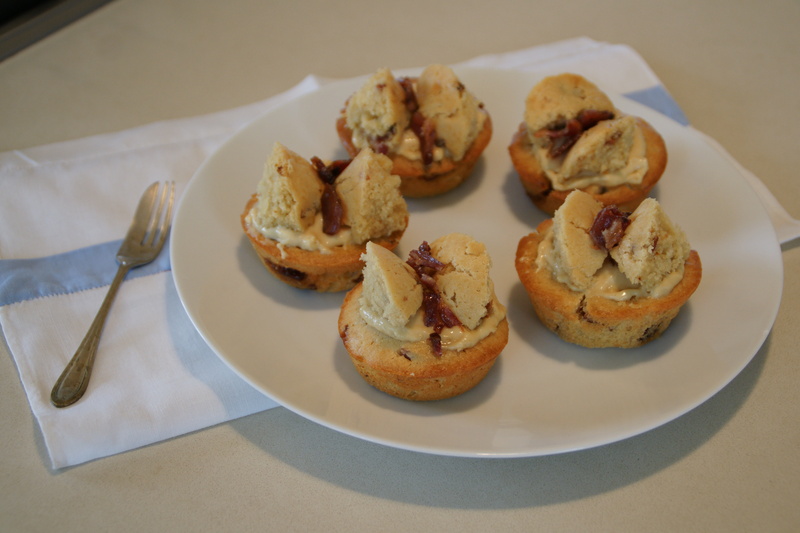 However, in the spirit of the Daring Bakers Challenges I decided to embrace my baking fears and make candied bacon fairy cakes. Who can resist a fairy cake?! At the time of making the challenge, I was away with my family for the Easter/ANZAC Day holiday. This was helpful as it meant more test subjects! It also meant that each stage of the process was closely observed by various family members, particularly my father. He was quite distressed by the perceived waste of bacon and at one point asked what the bacon had done to deserve such treatment. 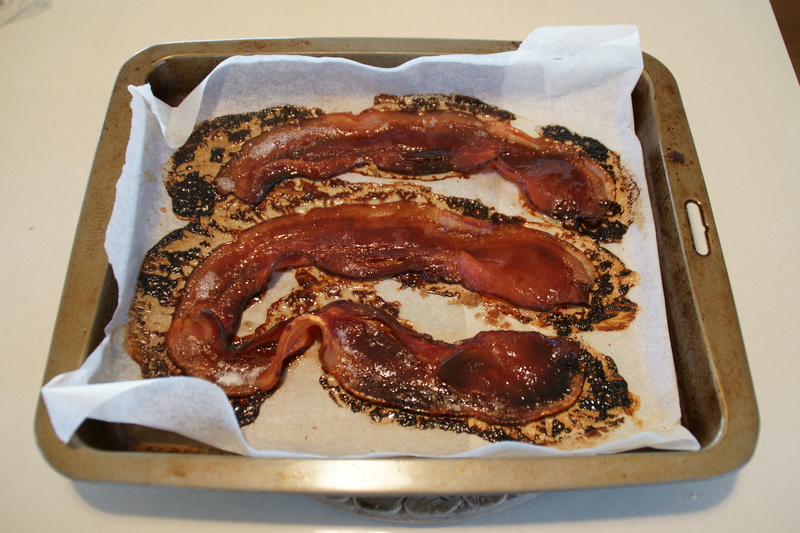 I said that if I was bacon I would quite like to be covered with brown sugar and baked – this was my highly technical approach to making candied bacon. My brother was also quite concerned by the sacrifice of lovely bacon, sadly shaking his head and saying that he just couldn’t accept the combination of bacon and sugar. 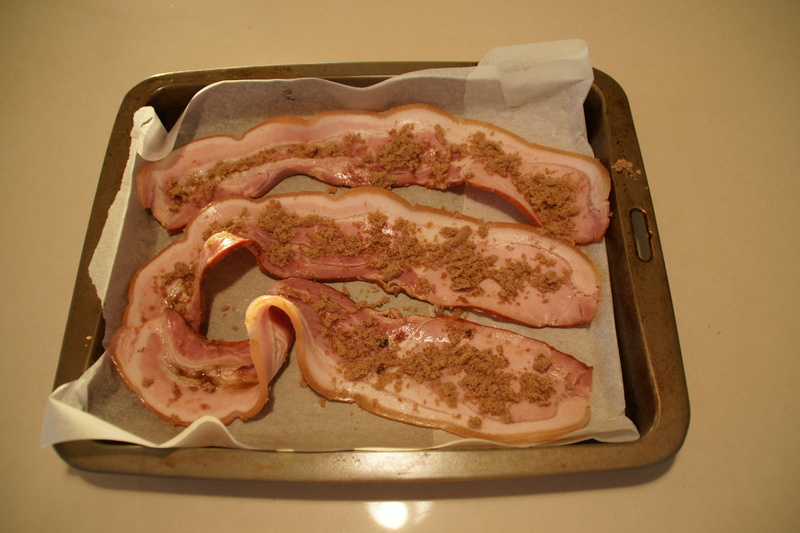 Here is a picture of the bacon before and after it’s brown sugar “torture”. It probably took about 30 minutes to make. I then chopped up the candied bacon and added it as a final component to my favourite cupcake recipe from Nigella Lawson. The only change I made was to cut the sugar in half, as I figured it would already be tooth achingly sweet from the mousse and the sugar on the bacon. Here is a picture of the cupcakes after baking. I then, with a lack of delicacy that will be evident from the photos, cut an inverted dome from the top of the cupcakes, filled the space with mousse and put the (now halved) cupcake piece on the top as wings. As a final flourish, I then added pieces of candied bacon as garnish. Somewhat to my surprise, the feedback from my tasters was overwhelmingly positive. My father, whose highest praise is generally “it’s interesting“, declared them to be positively good, whilst my mother suggested that they were the best things I had ever made. Even my sceptical brother gave them the thumbs up. So that’s a big thumbs up to Evelyne from me! What a cool idea! I also like the sound of candied bacon – must give that a try. I really loved the finished cakes..they look like butterflies.. I was also skeptical about the whole bacon-maple idea, and to be honest, I thought my husband wouldn’t even want to try it. But, surprisingly we both thought it was quite good! Congratulations on your gorgeous “butterfly” creation , I love how you used the cupcake insides as the wings, very clever! Great post, I laughed at the cruelty to bacon comments. Those are really neat – big thumbs up!! Well done on the challenge indeed! After reading many praises I decide to give bacon/maple mousse combo another try.